Be the first to share your favorite memory, photo or story of Cy. This memorial page is dedicated for family, friends and future generations to celebrate the life of their loved one. 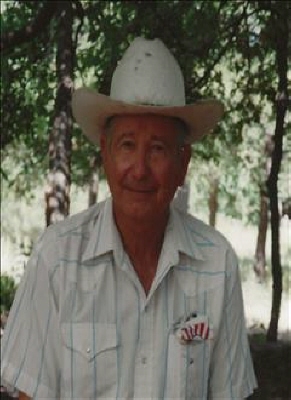 Cy Wilcy Moore, age 88, longtime resident of Hollis, Oklahoma, passed away Sunday, March 31, 2019 at the Duncan Regional Hospital. Cy was born November 26, 1930 to Wilcy and Grace Moore. He was raised and educated in Hollis, Oklahoma. On June 4, 1949 he married Frances Ann (Burns) Moore. They were married sixty-nine years and nine months. Cy loved telling the story of how he and Frances had been together their whole lives. He was a farmer thru and thru, it was his life's work. He also had worked at the sale barn. He was extremely proud of the fact that he was one of the oldest active farmers in Harmon County as he was still driving a tractor at the age of 86. Cy enjoyed hunting, jug fishing, going to the lake, going to Camp Doris and going to check on his cows with his wife Frances. He is survived by his wife Frances Ann Moore, one son; Michael Cy Moore and wife Twyla; Daughter; Jan Redelsperger and husband David, Five Grandchildren; Traci Stites and husband Mark, Amy Toomey and husband Chris, Kayla Redelsperger, Dakoda Moore, and Cheyenne Moore, Five Great Grandchildren; Logan Stites, Garrett Stites, Addison Stites, Luke Toomey and Layton Cy Toomey. Cy is preceded in death by his parents; Wilcy and Grace Moore, two brothers; Udell Moore, Billy Frank Moore, sister Lavonia (Moore) Sheid. Open visitation will be 10:00 a.m. - 6:00 p.m., Tuesday April 2, 2019 at Harmon County Funeral Home in Hollis, Oklahoma. Graveside services will be 2:00 p.m. Wednesday, April 3, 2019 at Fairmount Cemetery in Hollis, Oklahoma. Memorials may be made to the charity of your choice in honor of Cy Moore. Funeral services are under the direction of Harmon County Funeral Home, Hollis, Oklahoma. To send flowers or a remembrance gift to the family of Cy Wilcy Moore, please visit our Tribute Store. "Email Address" would like to share the life celebration of Cy Wilcy Moore. Click on the "link" to go to share a favorite memory or leave a condolence message for the family.